A superior sieving instrument, the Sonic Sifter Separator is precise, versatile and ideal for research and quality assurance applications. 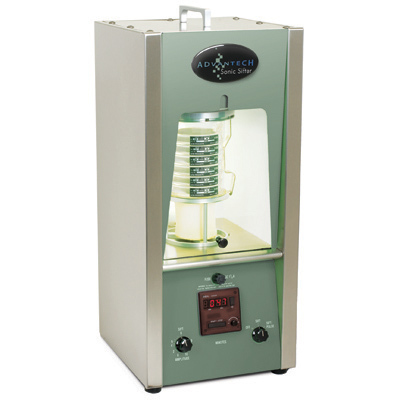 Specially designed 3" Diameter (76.2 mm) acrylic-framed sieves and a patented oscillating air column allows this unit to achieve efficiencies previously seen only with wet sieving for materials in powdered, granular or pellet form and is capable of achieving separations ranging from 3 µm to 5.6 mm. The Sonic Sifter is virtually maintenance free. There's no screen wear or particle attrition. Particle separations can be accomplished in less than 10 seconds under favorable conditions - cutting testing times by up to 90% over other compared methods. a vertical mechanical pulse shears agglomerates and reorients the particles in the air column. separate particles is infinitely adjustable. • Fine particle separation for dry sieving ranges from 3 µm to 5.6 mm using six 3"
(76.2 mm) sonic sifter sieves or three precision electroformed nickel sieves. • Automatic timing ensures repeatable results.